Since we spend so much time in them, let’s talk about your appraisal vehicle. How organized is it? Does it make you more efficient? Does it help you create value for others? Is it an appraisal tool, or just another thing that’s part of your stuff? Let’s start with your computer bag. What’s that? In my case it’s a laptop bag with lots of pockets. It is lightweight and I carry it with me practically everywhere I go. In my bag is, of course, my laptop, a Lenovo Yoga II. It is light and cheaper than an Airbook®. There’s the cord to keep the battery charged (its good for about four hours per charge). I also have a hotspot on my phone so I can pull over on the side of the road to use the internet, or contact my office, if I need to. Back in the office there is a server all of my employees and independent contractors can log-in to. On it, I can get on any appraisal record at any time and do whatever needs to be done from the field. I highly recommend this set-up. Then, there is my Disto laser, an X4. I also keep a back-up Disto. Though it is well used, it still works – just not near as well as the new Disto X4. I also have a tape measure just as a backup to the back-up. I don’t use it very often, but it’s there if I need it. 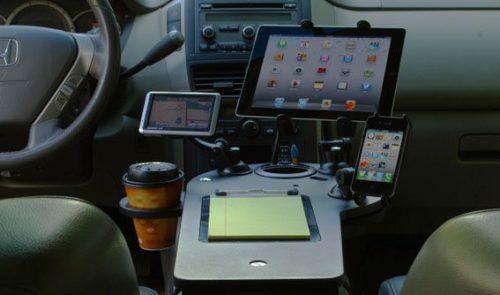 In the car itself, I have my iphone mounted on the dash so it’s easy to access – I don’t have to take my eyes off the road to answer it. The phone has a voice-to-text function so I can dictate my texts, not thumb them in. Another safety factor and time saver, too. Since I’m a germophobe, I keep hand sanitizer in my car, too. That’s for my own convenience when I go into other people’s homes. I don’t want to leave any of my germs in their house, nor carry out with me any of theirs. It’s just a matter of being safe and healthy. I also have my business cards out where I can reach them easily. I always have some in my shirt pocket. I also give the homeowner a small bottle of jam with a flyer thanking them for opening their home to me. With this gift, people tend to remember me in a positive light. That’s a plus when the homeowner calls me with questions. Since I spend so much time in my car, I keep it clean, neat, and organized on the inside. If I eat in the car (which is not rare), I clean up with no crumpled wrappers or stray french-fries stuck between the seats. Since I live in a rural area, and work in rural areas, the outside of the car tends to get dirty quickly. I have it washed when it needs to be, but spend most of my cleanliness efforts on the inside. Ok, now what’s in the trunk? I keep a box there with Fannie Mae and HUD keys. There’s a 15-pound ladder (an Xtend And Climb) that can really reach up there (about 12.5 feet) for looking in attics. It folds down and fits easily in the trunk. There are some booties in there to I don’t track dirt into anybody’s house (although it’s usually easier to slip off my shoes). There are boots in there, too, since I live in Idaho and there is often mud and snow to contend with. Then there’s my “get home” bag (go to my website and check out the video on what’s in that bag). There’s a selfie-stick when I need to take photos of places I cannot access easily. I keep a small snow-shovel in the trunk, too, just in case a snowstorm catches me high-centered in a rural area. So, now you know what I’ve got in my car – everything designed to make me more efficient as an appraiser. Tell me what you’ve got in your appraisal vehicle to let me know if I’ve missed anything. my horse tack, and riding rope (been used once when a horse got loose at a ranch I was appraising). Really that gear is there for other uses not appraising, unless property owner gets out of control and have to pull out the pigin string to hog time them, kidding of course. I still have old Thomas Guides in truck, just in case my GPS, cell and other delightful technology doesn’t work. Have back up batteries for my disto laser, spare gloves, tools for any minor repairs that might occur thanks to brush, car hiccups, gates or other items that seem to get in the way. In the winter even though it doesn’t get that cold down here, I have spare warm gear in case my truck breakdowns and I have to walk to get cell service. Also have sketch paper just in case my tablet and Total for mobile decide to not work (happened only once, operator error), but had sketch pad and pencil for backup. Last item is extra water when I head out into rural areas. Since I live in a moderate climate, don’t carry winter gear. Always have at least one firearm, (better to have …..) plus basic tools, expanded first aid kit, tow strap, wellies, redundant lasers, 100′ tape, batteries, munchies and AAA card (old and detest changing a flat). In addition to many of the things you and the commentators mentioned, I also keep a pair of coveralls, a face shield (for looking into scuttles of REO properties to protect my face from critters), and a 3M dust & mold respirator. I bought an inverter with the intentions of having it hardwired to my car’s battery so I can charge and run my laptop for the times when I forgot to charge it at the office. I cover a rural area and there’s not always a place I can stop and plug in. I like that you keep your car neat and tidy. I provide my appraisers with company cars to ensure they look professional and recently I borrowed a company car from an employee and found the inside to be disgusting and an embarrassment if one of our clients met him in the driveway. A professional looking car is a chance at a first impression. Often, simply not looking professional to the homeowner will make them question the credibility of your work product and you know what happens when people start looking for problems with an appraisal.